This is an option for assignments in which students will not submit anything in Etudes (i.e. an in-class speech). Adding an offline assignment is as simple as adding a title, points, and a description. That’s it. It has no parts, no pools, no questions. On the student side, there is no “Begin” screen since students will not submit anything in Etudes. 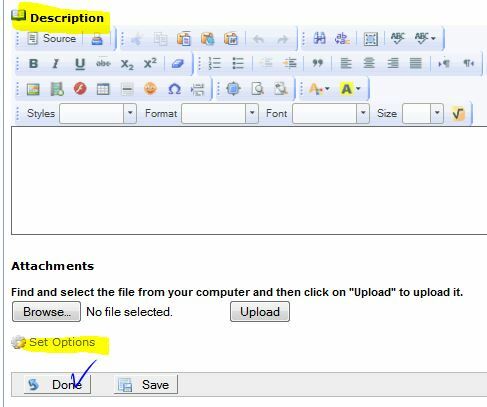 When students click on the offline assignment’s title, they see its instructions. Go to AT&S and then click on Add. Select “Offline” under type of assessment. Add a description for your offline assignment, including attachments, if needed (i.e. study guides, grading rubric). Click on Set Options to set dates, review options, etc. You can set options from the main page, as well. Click on Done or Publish, if you are ready to make the assignment available to students. Offline assignments benefit from all the powerful functionality of AT&S (i.e. automatic vs. manual release, global options, etc.). 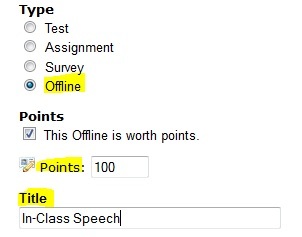 To grade an offline assignment, click on Grading, click on the assignment, enter scores and click on Save. If you have entered scores for offline work, you will see the live / graded submissions icon in front of the assignment. If you have not assigned scores to anyone for an offline assignment, there will be no grading indicator. If you release the evaluated offline assignments to students, they will see that they have been graded and will be able to access your feedback from AT&S, Course Map, Home Page, and Dashboard. The score will be posted in the gradebook, too, if you checked ‘send to gradebook’ in settings. If students have reviewed your comments and score for their offline assignments, you will see that information in Activity Meter.